L shaped desks provide a lot of flexibility when it comes to creating a productive yet comfortable workspace. Having the extra surface area of l shaped desk designs can make all the difference in creating an effective work environment. Because of the many options available for personalizing l shaped desks, you should first take into consideration your needs in the workplace. First, it’s important to consider the tasks and duties of the employee utilizing the desk. Do they meet with clients often? Will they be dealing with a large amount of paperwork on a daily basis? What kind of organization will they require? Having a strong understanding of the technology being used at the desk will also help to create a clearer sense of purpose when deciding upon the right desk. Computer towers, monitors, printers, scanners, and telephones all need space accommodations. Such tools also require power supply and cords to connect them which can create a mess unless properly tracked and hidden away. Even the sight of a tangle of cords can create stress in the work environment. Desk additions like a wire management system, modesty panels, and strategic desk placement can prevent such a distraction. Strategic and intentional placement of the furniture is another important consideration. The layout of the office space itself will have a great effect on desk placement. Architectural structures such as columns, windows, and doorways will affect the layout of the desks. Having a clear idea of outlet and window placement is also necessary. Having a PDF or CAD production of the office floor plan will come in handy when planning. Besides the physical space, considering the organization and proximity of employees will also come into play. Grouping departments or workers with similar job duties will not only be more efficient, but will allow for a more productive work environment. Finally, personal preferences for design and functionality can be incorporated into the desk. Standing desks are becoming more popular as studies about the effects of a sedentary work environment are becoming more prevalent. Desks with adjustable height can also improve ergonomics, even while sitting. 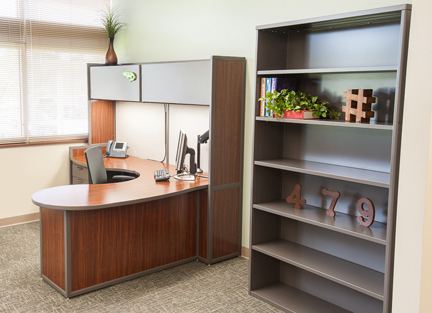 Tackable panels, shelves, filing cabinets, and other storage and display options help to complete the desk area. We spend a large part of our day at work. It’s important that the desk area is clean, organized, and pleasing to the senses in order to create a comfortable and productive workstation. With the countless options available and thinking through the design considerations mentioned above, this goal is easily achievable.